Foxcatcher by Mark Shultz - the story that inspired the major motion pictureMadmen, money, murder.... and wrestling.The Foxcatcher estate, Pennsylvania, January 1996. Dave Schultz, Olympic gold medallist and wrestling golden boy, is shot in the back by billionaire John du Pont. After a two day siege at the ranch du Pont is finally captured.It wasnt supposed to end that way. Du Pont had lured to his ranch Americas top wrestlers, the brothers Mark and Dave Schultz, with the dream of building a world-class team. 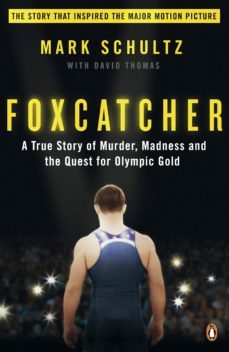 But as he grew paranoid and controlling, the brothers realised they were trapped.No one knows the inside story of Foxcatcher better than Mark Schultz. This book is a searing portrait of the relationship he and his brother had with du Pont, whose catastrophic break from reality led to tragedy.Now a major motion picture, this amazing story will be enjoyed by fans of Argo, Captain Phillips and American Hustle.Mark Schultz is an Olympic gold medalist and a national champion in free style wrestling. He lives in Southern Oregon, USA.